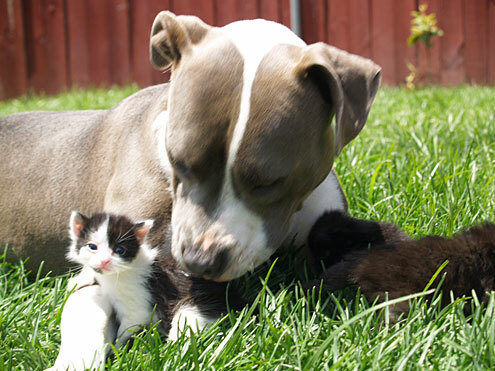 This page supports pit bulls. I am a content writer (if you're interested in content, please visit my other webpage). If anyone out there has stories about the hero (pit bull) in their life that they would like on this site, please send it to contentwriters@gmail.com along with the story. Please, no hate mail, your hate mail only proves how dull humans can be and I may publish it on this site with your name as well. 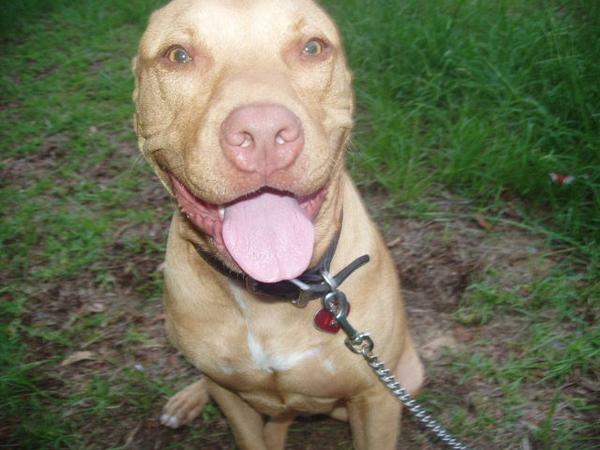 First, I would like to tell some information about my red nose pit bull, Copper. When Copper got hit by a car on 2/12/2009, the vet said his back end was paralized that there was no hope for him, except for euthanization. No, my dog was fully there, with some help, he could even walk, just couldn't use his back legs. Three weeks later he stood up on his own and can walk around. He loves life and loves everyone who comes around him. He is a sample of just how strong these dogs really can be and how vets jump to euthanization. If you believe there is ever any hope for you animal, please get a second opinion. The second picture is a picture of him after he was hit by the car. Today, he is able to walk and do what normal dogs do. He is in good health. 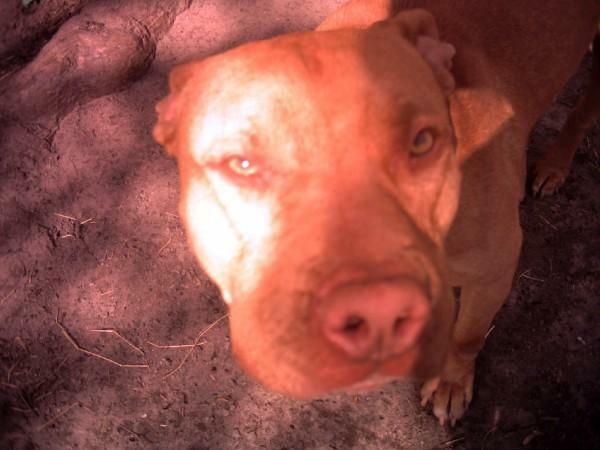 The picture below is a picture of my red nose pit bull, Copper. Why Hate the Entire Breed? Do We as Humans Hate Every Human for One Humans Actions? There is so much hatred regarding this very much loved breed and if you are a pit bull lover, you probably know a lot about the pit bull hatred out there. Have you heard of Breed Selective Legislation? There are many states and countries that are banning pit bulls from their area. Why ban them? Because they think they are killers. Let me ask you something, humans have been killing people, do we ban them from the face of this earth? Do we hate every single human out there for ONE human’s actions? No, we do not. PUNISH THE DEED, NOT THE BREED! Pit Bulls have Locking Jaws – MYTH! The truth is that the jaw of the pit bull functions just like any other breed out there. This has been proved by expert examination. Many studies have been done on this dog and they show that they are no different. They have no “locking mechanism” in their jaw. Pit Bulls are able to hold with their front teeth as they chew with their back teeth – Really, I do not see how this is possible. As I stated above, their function is no different than any other dog. Pit Bulls do not feel any pain – MYTH! They have the same nervous system as any other dog out there. Do you really think they do not feel pain? These dogs are just known to have a better toleration to pain and discomfort. Unfortunately, they feel pain every day when they are banned from seeing their owners. They have more bite pressure per square inch than any other breed of dog out there – MYTH. There are no studies proving that they have stronger jaws than any other breed. One test has been done comparing the bite PSI of some other breeds and it has showed their PSI to be lower than some of those estimates out there. Tests were conducted on the German Shepherd, a Rottweiler and a Pit Bull. The pit bull had the lowest bite pressure as it came to three hundred and twenty pounds per square inch of pressure. Pit Bulls attack more humans than any other breed of dog out there – MYTH. It is difficult to obtain those bit statistics accurately. Dogs that are referred to pit bulls in some of those reports are not actually pit bulls. They may be a mixed breed. It is hard to identify a true pit bull. Also understand that pit bulls are very important, so it is logical to say that the breed with the higher number of dogs also has the more bites. Pit Bulls turn on their owners – Dogs as a breed do not perform certain behaviors just because they are a certain breeds. There are always reasons behind behavior. When aggression becomes a problem, those reasons could be improper handling, lack of socialization, misreading a dog or lack of training. There are many signs that are ignored. Pit Bulls are only good for dog fighting – MYTH! This is not true at all. There are many Search and Rescue pits out there. There are many pit heroes. Sadly, humans do fight them and because they are very obedient, they listen. What? It’s not like they are fully there and go off and kill someone, like humans. Pit Bulls are Heroes - Just Open Your Eyes and See That! Stubby was a stray pit bull that was discovered by Private John Robert Conroy on Yale University Campus during the year 1917. Conroy was currently training for deployment to the European Front during WWI. Stubby became familiar with drill marching routines, bugle calls and even learned a dog version of a salute. He put his right paw on his right eyebrow during his salute. The commander of camp liked Stubby’s ability to give that salute and gave permission for him to stay with Private Conroy. They traveled to the frontlines with 102nd Infantry Division. As they were overseas, Stubby was wounded in action two times. He also saved his whole platoon because he warned them of a poison gas attack. He also single handedly captured a German spy. He was promoted in rank to a Sergeant. He was the first Pit Bull to be given any form of rank by the United States Armed Forces. This courageous dog served in seventeen battles while he was in Europe. He was the first decorated war dog. He lived during the time when this breed was love and respected by humans. In fact, they were the most popular dog in the nation. They were the symbol of American pride. There was no breed specific legislation out there that labeled them as vicious. They were admired for what they truly are and that is heroes. Stubby received the hero’s welcome and the White House even honored him. He inspired the United States Military K-9 Corps. Therapy Dogs International INC. is an organization that volunteers these dogs as therapy dogs. In fact, they helped victims and families that lost someone they loved after the attack that was done on the World Trade Center on September 11, 2001. May individuals suffered from depression and shocks after this and the pit bull was there to help them through it. Therapy dogs are used in different aspects of emotional rehabilitation. Law Dogs USA uses the American Pit Bull terrier for bomb detection and finding illegal drugs. You see, these lovely dogs have been protecting us since the beginning of time. I personally do not believe it is fair to try to get rid of them. Take Popsicle as an example of how bad humans can be. He was locked in a freezer in Buffalo NY during 1997. Police Officer Ron Clark Jr found his malnourished, bloody little body. It is concluded that this dog may have been used as dog fighting. The shelter considered what this little guy survived and got into contact with US Customs canine enforcement to see if he qualified for their dog training. He sure did. In fact, he graduated at the top of his class. He became a crime fighting, drug sniffing hero. In fact, he has the biggest drug bust at the Mexican border under his belt…or harness. There are hundreds of dogs just like Popsicle and Stubby that you do not know about. Do you really think they should die? If you do, then you ma’m or sir have no heart. I will continue adding information to this site, so please bookmark it and keep checking back.